There’s no better day than Fantasy Baseball Draft Day! And we know you want to experience every single pick, along with the anxieties and the joys of bad/good picks! So we’ve updated our “Free Fantasy Baseball Draft Tools” list with a couple new ones, including the guys at Prospect361.com. Enjoy! Every year, I write an article about the best Free Fantasy Baseball draft tools on the web, and every year, I have to add a bunch of stuff to the list. 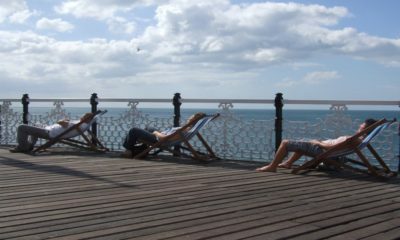 This year, I’m posting it on SoCalledFantasyExperts.com – and we plan to post more things like this from now on! We want to help you to championships – even if that means sending you to other great websites and other writers. That doesn’t preclude us from sharing some of our favorite things on our site, of course, just so you’re aware of what we have going on! This Fantasy Sports website began in late January, and we’re picking up steam every day. We have over a dozen Fantasy writers churning out great content for us, and we have new tools and series coming out each week. You likely won’t be able to use every single one of these things, but I’m guessing you’ll be happy with most of them – and your chances of winning will no doubt increase exponentially! First, we’ll share five free Fantasy tools on our website. 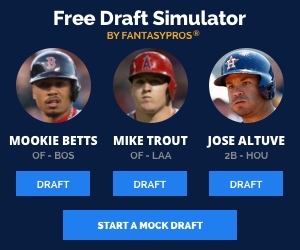 We’ve installed this free Fantasy Baseball tool on our own site, and it’s without a doubt the easiest/fastest way to start your preparation for your own draft. Run a mock draft by yourself, with the computer drafting for the other teams based on the consensus rankings from FantasyPros.com. You can set where you want to pick, tell it how many teams and how many players start at each position, and you can even choose the eligibility rules. Finally, once the draft starts, you can even back a pick out if you need to and try another one. Email the “So-Called Fantasy Experts” for free and get your answers quickly from guys that have been playing this game for 10, 15 and 20 years or more. Did I mention it’s free!?! … Well, everything on this list are free Fantasy Baseball tools, so yeah, I guess I mentioned it. Goose tracks down the best Fantasy Baseball articles every morning – and every afternoon – and he sifts through all the junk to find the gems for your reading pleasure. Whatever you do – don’t accidentally type in “Fantasy Rubdown” in the URL window. These guys built an entire site around the closer position, and they shoot you updates on bullpen news from the previous day. This is an awesome way to learn about bullpen trends, and finding out which closers might get a night off because of pitching in consecutive games. Nobody follows MLB bullpens like these guys, and they’ll help your Fantasy team get players expected to pick up saves well before your competition. Why pay for expensive closers when you can get their updates for free? Check out the post I put together that lists out all of the players with multiple position eligibility for 2016. It lists all of the players that played at least 20 games at two different positions in 2015, which makes them movable in Fantasy lineups this season. Each week, Ron Shandler – top-five on the most-respected Fantasy writers list – and his crew churn out a free newsletter that highlights some of their content from the past week. The current article on this page is from last season, but the emails coming through right now are very up-to-date for 2015. They also offer two free Fantasy Baseball articles per week. Every email includes reactions to recent news, “Facts and Flukes” skills analysis, and a lot more. The following bit is from the “Facts and Flukes” section about George Springer from Jan. 30’s email. You might have an idea of which players rank higher or lower at each position, but this site does a great job of collating all of the opinions of Fantasy Baseball writers there, and giving you a wide-view perspective. You can even choose which experts you want combined rankings from. You can also sort by ADP. Get an idea about any player’s trending stats to help you project his future better, using all of their graphs. Note how Dustin Pedroia’s ISO has dipped below league average of the past two seasons. If you haven’t set up “Google Alerts” for the things in this world you’re interested in, then you’re missing out on a lot of great articles about the things you’re interested in! Type in “Fantasy Baseball” in the box that says, “Create an alert about” and you’ll get notified (I choose once per day) with articles about Fantasy Baseball. These alerts are usually only meant for websites that have proven to break news, like newspapers, so expect a lot of Fantasy Baseball articles from news websites like USA Today, RotoWorld and CBS Sports. It’s one of my favorite emails to read every morning. After years of dealing with the not-updated depth charts of CBS and MLB, and flipping back and forth on the leagues at Rotoworld, we finally have the definitive spot for MLB depth charts. They also list the injured players, and share the 40-man roster, along with the best prospects at each position. While these guys also do a nice job with their depth charts, they also include “Comings and Goings,” which lists players newly arrived or departed, as well as each player’s stats and games played by position – all on one tight page! This is a download that helps you get through a draft while keeping your fingers on the pulse of everything that has happened in the draft. It’s an auto-updating Excel spreadsheet that crosses off players, team-by-team analysis, real-time projected totals and a goal-tracking dashboard. A lot of people would like to make their own projections each season, but aren’t sure where to get the stats. Here you go! Download stats for every season, dating back to 2001! You can then combine the past three years, get a good 3-year average for each player, then project accordingly by increasing or decreasing their numbers by a percentage. One of the best things on the Internet in the past few years, after the social media boom, has been “crowdsourcing,” whether it’s for funding or for projects – or for information. That’s essentially what this Reddit is for – crowdsourcing Fantasy Baseball help from all of the posters and Redditors. This is one of my favorite free Fantasy Baseball draft tools because it is ever-changing and always up-to-date. Even if you don’t post comments, just reading all the other questions and comments will help your game. Use this free forum to find some players for your Fantasy Baseball league – or find a league to join yourself! Every weekday, Adam Aizer hosts this live video show, which allows you to email or call into the show between 12 and 1pm ET. Go up against hundreds of other CBS users multiple times a day in mock drafts using CBSSports.com’s award-winning draft rooms. You can choose between Head-to-Head, Rotisserie, mixed leagues, -only leagues, keeper leagues, different sizes, etc. Not everyone has a subscription to Baseball America, so the next best thing might be MLB.com’s minor-league reporters, led by Jonathan Mayo – one of my favorites. He has a Fantasy background (LABR) also, which makes him even more interesting to follow. MLBPipeline.com’s Top 10 by Position: Theirs is definitely prettier, and laid out better. You’ll also be able to read about each player individually. BaseballAmerica.com’s Top 10 by Team: They started all of this prospect madness, and I like that each team’s prospects are broken down. BaseballProspectus.com’s Top 10 by Team: It never hurts to get another opinion on the best youngsters on the rise! This is sooo deep, bring some scuba gear! “The list is comprised of players drafted in the 2014 first-year player draft as well as Latin Players who have signed since your Fantasy draft in 2014.” Just a great resource for preseason — and in-season, in my opinion. Great free site you should add to your arsenal. This is a free daily email that “showcases the best performances from last night’s minor league boxscores.” But it’s not just for in-season, as it talks about prospects playing in the Arizona Fall League, the Puerto Rican League, the Dominican League, the Mexican League and the Venezuelan League. Sign up – it’s pretty much awesome. It’s one thing to see who Fantasy writers picked in a mock draft, but it’s a whole other thing to read WHY they made that pick. I gathered 12 Fantasy Baseball writers from 12 different websites, including Mastersball.com, FantasyAlarm.com, FantasyPros.com and FakeTeams.com. They each wrote an explanation on every one of their draft picks. It’s a slow draft, with one or two rounds happening a day, so catch up now! 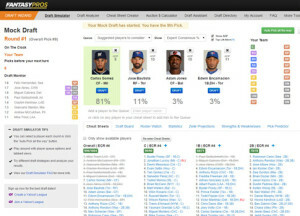 Zach Steinhorn from the Fantasy411 blog on MLB.com invited me to an analysis mock draft with writers from MLB.com, Bleacher Report, RotoWire.com, Mastersball.com, FantasyAlarm.com and USAToday.com. It has been a ton of fun so far, and we’re about halfway through it. They’re the only website that’s posting the results of both sets of experts drafts, as well as in-season FAAB analysis from the expert bids each week. Follow along with a few dozen expert writers as they prepare for the most notable experts draft in all the land! The Mixed League draft takes place on March 21, and the AL-only draft is earlier in the day, with the NL-only draft following on Sunday morning. Even after the draft, owners will be chipping in articles on this site throughout the season as to why they made certain in-season moves. While their services cost money, this blog is actually free. Some of the contributors to the blog are some of my most favorite Fantasy writers – from the past two decades! 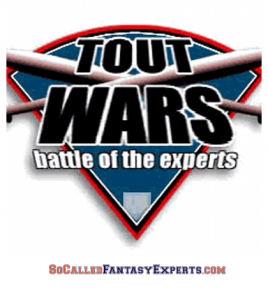 Guys like Chris LIss, Jeff Ericson and Derek VanRiper – the Tout Wars Mixed League champion from a season ago. Be ahead of the curve – and your opponents – by seeing what’s coming before it happens. This is like the baseball version of ProFootballTalk.com. Great tidbits and conjecture on players, teams, transactions and possible trades. If you’re not on Twitter, then you are definitely at a disadvantage when it comes to playing Fantasy Baseball. 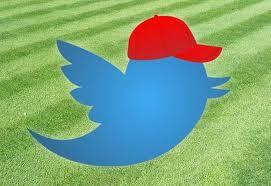 Here’s a quick article on how to use Twitter with Fantasy Baseball. And yet another article I wrote about the top 99 Fantasy Baseball Twitter accounts you should follow! I’ll be updating this last one soon! He’s easily my favorite Fantasy Baseball writer/personality. He mentored me at CBS in the mid-2000s, and I offer about 30-percent of what Cockcroft offers from a game knowledge standpoint. I’m way better at wings and softball, though. Take THAT, TC! He updates these rankings starting in like October of the previous year, and people look to it as the gauge for offseason rankings until other sites pick up speed in February. I was in on the meetings, back in the mid-2000s, that asked the writers what kinds of data users would like to see on the site. I’d love to say I came up with the “Most Added,” “Most Dropped,” “Most Viewed,” and “Most Traded” players lists, but I didn’t. I did, however, agree that it’s awesome! If you are in a CBS league, you’ll also get to see the “Most Owned” players. While this is still one of the top free Fantasy Baseball draft tools, it’s also much better for in-season help. Taking the cue from CBS, RotoWorld shared their own version of the “Most Viewed” list from the past seven days, and considering how many people use this site for their Fantasy news, these numbers are even more relevant. The module is located in the middle of the MLB home page. During the preseason, I like to check the headlines as soon as I wake up, then I go back over the news updates throughout the day. You can load up RotoWorld’s mobile phone app and use it for either. In reality, a company could come in and destroy RotoWorld if they ever made a better phone app. The Fantasy Sports world is quickly moving over to mobile devices. I just hate searching for players on it. If you didn’t like our Fantasy Baseball email advice page – you might like theirs! Better yet, email them both for help! These guys pull in RSS feeds from dozens of Fantasy Baseball websites, and you can read all of the content in just one place. Or you can set up a Feedly account and have them all streaming through there. Either way, you’re not missing one article – ever. I mean, unless you blink or whatever. 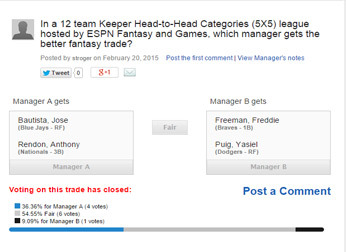 Using trade raters on some sites is nice, but what about keeper trades, where you need to enter more information? This site allows you to do just that – and then the community votes on the trades! They let you know if they think you win the deal, if you’re getting screwed of if they think the deal is fair on both sides. Our friends at DiamondDraft have helped us set up a tool to derive customized dollar values for Fantasy Baseball players. Never go into an auction again without your own dollar values! Devin Jordan set up this great feature. 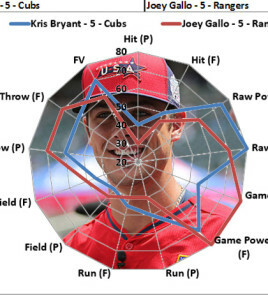 Users can choose two current minor-league prospects to compare them against each other in a spider chart. In other words, choose Jorge Soler in the first dropdown and Steven Souza in the second dropdown – and you’ll see that while both players have similar power right now, Soler is expected to have much greater power in the future. This is a GREAT dynasty league tool! This is basically the home website for every Major League prospect, and they really do a nice job of breaking down their stats into useful chunks, like the player’s last 10 games. You can insert the type of league, league size, total salary cap, and even the percentages you’d like to budget for each position! I like! FantasyPros.com’s Who Should I Draft? This site breaks down, well, who you should draft between two players. Hanley Ramirez or Ian Desmond? Max Scherzer or Adrian Beltre? OK, so this might be the third tool of this type on this list, but I like that they make it simple and just ask which percentage of your budget should go for all hitters. Move your players all around, create tiers, add notes – it’s all at your disposal! You can even choose which players you want to target from different tiers if you like. These guys really have thought of everything! You can tie in your ESPN, CBS or Yahoo leagues, and let it help you make your picks! You’ll have the draft room pulled up side by side with their Draft Wizard! You can find these in other places, but Fangraphs displays them the best, I think. These MLB hitter and pitcher projections are considered to be the best computer projections around. These guys track the comings and goings of every MLB bullpen, and they discuss it in a blog post, with graphs and gifs and fun! This was created specifically for Fantasy Baseball players, as it lists the closers in tiers, like Elite, Stable Situations, Uncertain Situations and Injured Closers. Then, they list who the “Next in Line” might be, with the “Saves Sleepers” as the ultimate deep-league Fantasy helper. “Closer Notes” are updated when something happens, also. Again, while this is one of the best free Fantasy Baseball draft tools, it’s also awesome in-season. The worldwide leader also does an excellent job of tracking gamestoppers. They actually have four different categories that they sort each team’s relievers into: Closer, Next In Line, Stealth and Looming. I like that they have a quick comment about each player, along with their status and when the injury occurred. Figure out which parks are more favorable for hitters and which ones are better for pitchers – and which ones are essentially neutral for both! The best part of this tool is that it also breaks it up by right- and left-handed batters, and it shows the percentage of hits that go for home runs, triples and doubles. When you’re dealing with breakouts, busts and sleepers, and trying to manage your Fantasy Baseball draft, the last thing you need to spend brain cells on is thinking up a great Fantasy Baseball team name. We’ve done that job for you, with over 200 great team names based off of current major leaguers. Lacking some creativity these days? It’s tough to come up with a great Fantasy Baseball team name every year, so these guys have created a great tool to help you get past writer’s block. 1. Pick a category from: Non-Pro Team City, Agitated Adjective, Goofy Adjective or Fancy Adjective. 2. Pick from eight mascot categories that include: War terms, Things that Sounds Dirty But Are Not and 1980/90s Player Last Names. Then voila! You have yourself a Fantasy Baseball team name, like the Akron Pipelayers or the Rotund Throat Lozenges! Give it some time, once you “Submit Form,” as it takes about 5 seconds to load the name. MLB.com’s Fantasy 411 – My two favorite podcasters – Cory Schwartz and Mike Siano – talk Fantasy Baseball. Did you know both of them are actually big-timers at MLB (Schwartz is like the Stats Czar and Siano is like VP of Awesome or something)? ESPN’s Fantasy Focus – If you haven’t listened in a while, you might be surprised to find the hosts are now Eric Karabell and Tristan Cockcroft — two of my favorites. Karabell was one of the original Fantasy guys at ESPN, and Cockcroft is the absolute best in the business. Quote me on that. CBSSports.com – Adam Aizer is my favorite podcast host in the industry – and I’m glad he’s back on the CBS Sports podcasts! BaseballProspectus.com – Pick your poison, as they have several different shows to choose from, all dealing with baseball. FanGraphs.com – RotoGraphs Audio – There aren’t many things that FanGraphs does that I don’t like. DearMrFantasy – Joe Pisapia, who will be contributing to SCFE this season, and Chris McBrien have great guests each week to discuss the Fantasy Baseball world. RotoWire.com – Derek VanRiper and Co. do a rock solid job in their podcast, just like how Chris Liss and Jeff Erickson rock it out on SiriusXM Radio. Sign up for a free account and you can watch their shows live every day. These guys also have deals with a few Cable TV providers, including in Canada. I like watching them through my Xbox One and pretending my Cable TV provider finally has a Fantasy Sports channel! You can also watch their shows through their free FNTSY mobile app! Ray Flowers, one of my favorite SiriusXM Fantasy Sports Channel personalities, does some entertaining/informative videos over at FantasyAlarm.com. While this isn’t necessarily a Fantasy Baseball newsletter, it’s a great way to start the day! You’ll get a handful of links to MLB news items and articles emailed to you each morning. Create or Log into your MLB.com account. Select “Email Subscriptions” in the dropdown box on the top right. Select the newsletters you’d like to receive. Click on the “Save Subscriptions” button. If you don’t use Google Chrome as your web browser, you’re already making bad choices. If you are using it (It’s free, you know), you can download this “FantasyLink” extension, which will integrate links to BaseballReference.com and FanGraphs.com on leagues hosted at ESPN, CBSSports.com and Yahoo! Fantasy. This gives you that extra edge, with instant access to the ridiculous amounts of information on BR and FanGraphs. Over five dozen free Fantasy Baseball draft tools! If you didn’t find a bunch of useful free draft tools in here, then you can yell at me over Twitter – or in traffic. It’s common in both places. If you know of some free Fantasy Baseball draft tools that I might have missed – PLEASE email me at gonos@socalledfantasyexperts.com! 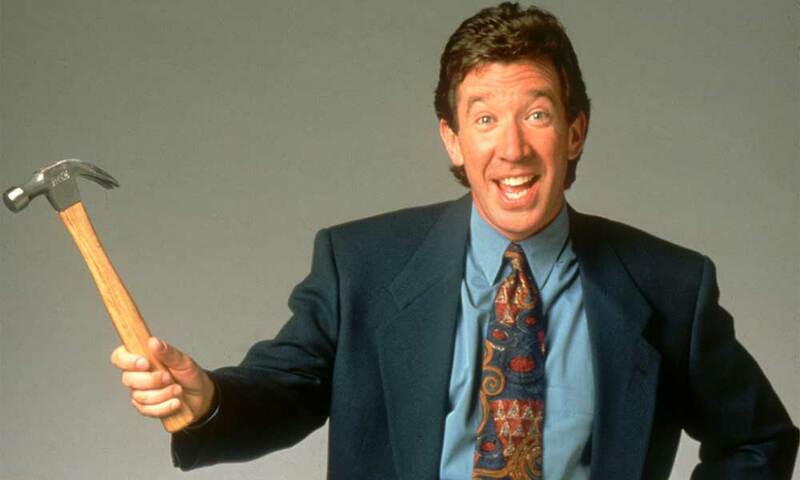 If I mistakenly called a tool above free that is actually a pay tool, let me know about that also! (That has happened before, as websites turn a free tool into a pay one.) Good luck this season! David Gonos has been writing about Fantasy Sports online since 2000 – and playing Fantasy Sports since 1989. He has drafted both Curt Warner and Kurt Warner, along with Big Unit and Big Papi. A veteran of hundreds of drafts in the past 15 years alone, Gonos is closely acquainted with sleepers, breakouts and busts – as he has drafted many of all three. He was a Senior Fantasy Writer for CBSSports.com for five years, and he has been columnist on SI.com and FanDuel.com, while also getting published on MLB.com, NFL.com, FoxSports.com and USAToday.com.